These adorable mushrooms are in every children’s book illustration. They’re so cute, with their bright red umbrellas and white spots! They’re also psychoactive. And toxic. They’re called Amanita muscaria, or fly agaric. You might have even sat on stools painted to look like this mushroom while reading the children’s book. If a kid stumbles across it in a forest, it may provide an ideal lesson in not eating things just because they’re pretty. Flies don’t live to learn this lesson. 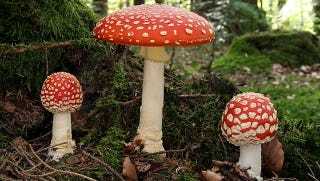 Fly agaric gets its name because flies are attracted to the scent, but are killed by the toxins in the mushroom. Human fatalities are almost nonexistent, but humans can get very sick after eating just a few of these mushrooms. The fact that these mushrooms poison people is well-known, and yet people persist in eating them. Why? Well, it’s almost as if the mushrooms offer some special inducement. But what could it possibly be? It’s the fact that they’re psychoactive, obviously They contain muscimol, which is a compound that stimulates the GABA-A receptors in the brain. These receptors, when engaged, inhibit the nervous system. They induce drowsiness and a kind of hypnotic state, as well as a sense of euphoria. When people eat fly agaric, they get muscimol two different ways. They get the molecule itself, but they also get it as the remains of ibotenic acid. When ibotenic acid gets a carboxyl group (COOH) yanked off of it, it becomes muscimol, and gives agaric eaters an extra kick. Not all of it gets decarboxylated, though. And that is a shame, because ibotenic acid is relatively nasty. It has been used to cause brain lesions in rats — not found to cause them, used to cause them. The neurotoxins (and technically both muscimol and ibotenic acid are neurotoxins) can be greatly reduced by boiling fly agaric, but they can’t be eliminated. Some people believe they can make the mushrooms completely safe by cooking them, which has led to some hospital visits. Other people show up at the hospital slurring their words and spewing out of both ends because they weren’t aware of the onset time. Fly agaric mushrooms take a couple of hours to “kick in,” giving impatient people a chance to eat too many. The lesson here is, if you’re going to eat Amanita muscaria, eat just one. Or maybe just read a book about them. Top Image: Holger Krisp, Ulm, Germany.